Reading charts is an art form that can take years to fully master. Why do we read charts? Because, by reading charts, we can determine what the "big money" is doing! You have to be able to analyze a chart and come to a conclusion about whether or not to risk your hard earned money on a trade. That is really the bottom line. And this is what separates the novice trader from the professional. There are several factors on a chart that make it worthy of trading. By analyzing these factors, we can determine with high probability which direction a stock will move. What stage is this stock in? Is this stock in an uptrend or a downtrend? Is the stock at the beginning, middle, or end of the trend? How strong is the trend? Where are the trend lines? What wave is this stock in? What do the moving averages tell me? Was there a breakout recently? Is the chart "smooth" or "sloppy"? Are there wide range candles in the direction of the trend? Are there any gaps in the direction of the trend? Are professionals selling strength or buying weakness? Where are the support and resistance areas? Is this stock at a Fibonacci level? What does volume tell me? I know it seems like a lot of information to try and keep track of but all of the above questions are essential to chart reading mastery! Now, copy and print out that list of questions and keep it handy next to your computer. Make several copies so that you can check off and make notes as you analyze your next chart. Got it printed out? Great! Now you won't forget anything important when it's time to analyze a chart for your next trade. In the heat of battle, when emotions are running high, it is very easy to forget to look for some of the most basic things on a chart. I've done it. That is, until I made this list! Ok, now let's go through the list one by one to make sure that you know how to answer the questions correctly. Don't worry, with practice, you will not even need to think about these things. It will become automatic. You will be able to read charts with lightning fast speed. In just a couple of seconds you will be able to glance at a chart and know all the answers to the questions above. Nice chart! 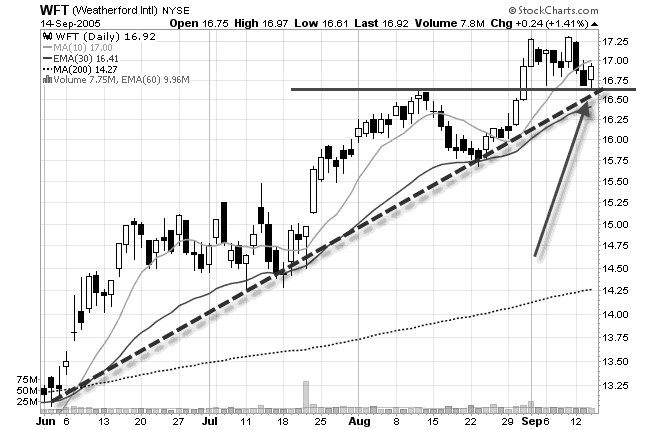 This stock broke out through a consolidation in July and now it is in a nice strong trend. The arrow is the day on which we see this stock. So, what questions can we answer just from glancing at this chart? This stock is in stage two. You remember the stages right? Stage one is a consolidation, stage two is an uptrend, stage three is another consolidation, and stage four is a downtrend. This stock was in a stage one in July but at the end of July, it broke out into a stage two. It is currently still in a stage two. This stock is in an uptrend. This is the easy part. If a stock is heading toward the upper right corner of a chart then it is in an uptrend! For some reason, this tends to elude some traders! This stock is near the middle or end of the trend. How do we know that? The breakout signals the start of the trend. There has already been one significant pullback. Had we bought stock on the first pullback, then we would have concluded that we are at the beginning of the trend. But since this is the second pullback, then we know that this trend may not last much longer. This stock is in a strong trend. The ADX indicator (not shown) is near 30 which we consider to be a fairly strong trend. The higher the ADX, the stronger the trend. This stock is at the lower trend line. You can see by the thick green line that this stock has hit the lower trend line. You can draw the trend lines in manually, but after you have been trading for awhile, you will not need to draw them. You will be able to see them automatically. This stock is in the fourth wave. In Elliott Wave theory, a stock goes through 5 waves in an uptrend. In the chart above, the first wave after the breakout is wave 1. The first pullback is wave two, the next wave up to $17.33 is wave three, and the pullback that we are in now is wave four. There is one more wave to go! Now we have identified that the possible future direction of this stock is up. Nothing is ever certain in the stock market! However, by looking at this chart we can be certain that the probabilities are on our side for a continued move to the upside. After you finish reading this tutorial, run your scans and go through some charts. Try to identify the various factors mentioned above. Just understanding the nature of stocks and the different stages, trends and waves that all stocks go through will greatly improve you trading. Soon, all of this direction analysis will become second nature. You won't even have to think about it.